Fallen leaves with falling rain… (explore), originally uploaded by Olivia Bell. 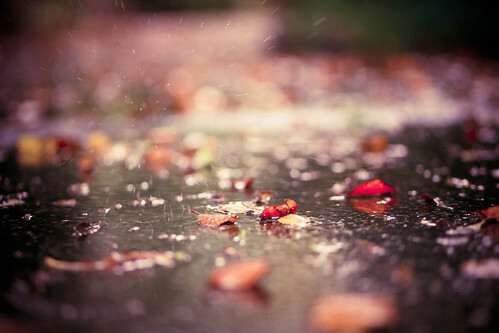 The rain falls and washes away the dry of summer and I couldn’t be more relieved. I love the muted skies and crisp breezes. I love the trickle of rain all day replenishing the trees and grass…filling up the rivers and streams. I love family and friends and how the upcoming holidays seem to bring them just a little bit closer, a little more often. I love sending greeting cards and updates to how my fall has begun. I love leaves blown around, sticking to my windowsill. I love that my chickadees, the crows, the woodpeckers and my hummingbabies still visit when all the other birds have flown south. I love making imprints of leaves and telling everyone how grateful I am for all the little and big things they do that affect my life without seeming corny, or despite it! I love that Autumn warms its colors to help fight off the chill setting in. I really, really love November! I can’t believe how quickly this year has passed by. It is already November! And I am terribly behind in my reading goals because they were very specific—not from a lack of reading, I just tend to read a bit more organically by choice. I am also behind in my list of things to do. Having said that… I am NOT behind in my journey to niceness. I have been diligently sending postcards to strangers and friends alike. I have been leaving little notes and gifts. I have been paying for the people behind me in drive-up windows. I have been following the suggestions by the wonderful Operation Nice. And I have been spending time with the people I care about, and isn’t that the point of life?